Tests of the agglutinating foram Saccammina sphaerica. Scale bar = 500 μm. These are the lectotype and paralectotype of this species held by the British Natural History Museum. 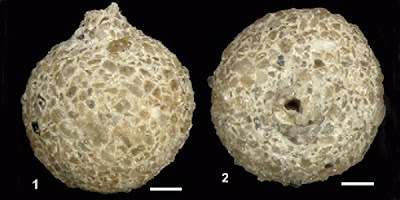 Foraminifera are one of the best-known of protist groups and may make up more than half of the benthic biomass in some marine habitats, particularly in the deep sea (Gooday et al., 2001). Forams are amoeboids with filose pseudopodia that branch and rejoin each other to form a net for the collection of food particles. The great majority of forams are marine, and most (but not all) forams produce some sort of protective test or shell with the filopodia extending from openings or pores in the test. Because of this test, forams are one of the few protist groups with an extensive fossil record. Indeed, their use in biostratigraphic studies (and leading surveyors to small treats such as oil deposits) has lead to forams being better known from a palaeontological than a Recent perspective and the structure and morphology of the test has long been a major factor in distinguishing and classifying forams. Forams may secrete their own tests (usually chitinous or calcareous) or they may construct a test from sand grains and/or other foreign particles (these are known as agglutinating forams). A distinction is also commonly made between monothalamous forms, in which the test is not divided into chambers (at least, not by complete septa), and polythalamous forms, in which the test is divided by septa into a number of chambers. However, molecular phylogenetic studies of recent forams have shown that monothalamous forams are paraphyletic while polythalamous forms are potentially polyphyletic (Flakowski et al., 2005). Also, while monothalamous taxa may produce chitinous or agglutinated tests, the type of test produced does not appear to correspond with phylogenetic position (Pawlowski et al., 2002). Despite this, foram researchers continue to use the old test-based classification for the simple reason that no-one has yet come up with a better alternative (and doing so would not be easy). The Saccamminidae as generally recognised are a large family of agglutinating forams with generally a single chamber (or sometimes a bunch of similar chambers loosely attached to each other), usually with a single aperture. They may be globular or more elongate in shape. Some saccamminids are quite catholic in their choice of building materials but others may be more fussy. Perhaps the ultimate in fussiness is expressed by Technitella thompsoni which builds its test with nothing but the ambulacral plates of brittle stars (Cushman, 1940). 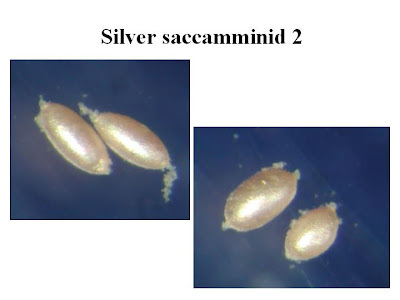 The 'silver saccamminid', an as-yet unidentified species that has appeared in a number of phylogenetic studies. 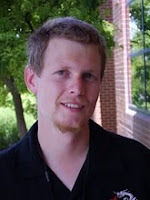 Photo by Jan Pawlowski. As with other monothalamous groups, molecular phylogenetic studies have indicated that "saccamminids" are polyphyletic with representative species scattered in various positions among the basal part of the foram tree (Cedhagen et al., 2009; Gooday & Pawlowski, 2004). Despite a fossil record extending back to the Cambrian (with putative 'saccamminids' at least as far back as the Silurian) and a significant abundance in the modern marine benthos, agglutinating forams are not as well-studied as calcareous taxa and monothalamous forms are particularly poorly so. For a start, they are often extremely small. Ecological studies have found the majority of 'saccamminid' specimens to be much less than 100 μm in diameter (Gooday et al., 2001) though Pilulina jeffreysii reaches more than 4 mm (Cedhagen et al., 2009). 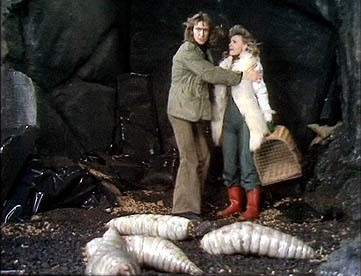 Also problematic, particularly for palaeontological studies, is that agglutinating foram tests are often difficult to distinguish from their surrounding environment because they are, after all, made from their surrounding environment. Perhaps the best demonstration of this issue is that the Stannomidae, despite being the largest of all forams and reaching over a foot in size, have no recognised fossil history at all. Cedhagen, T., A. J. Gooday & J. Pawlowski. 2009. A new genus and two new species of saccamminid foraminiferans (Protista, Rhizaria) from the deep Southern Ocean. Zootaxa 2096: 9-22. Gooday, A. J., H. Kitazato, S. Hori & T. Toyofuku. 2001. Monothalamous soft-shelled Foraminifera at an abyssal site in the North Pacific: a preliminary report. Journal of Oceanography 57: 377-384. Gooday, A. J., & J. Pawlowski. 2004. Conqueria laevis gen. and sp. nov., a new soft-walled, monothalamous foraminiferan from the deep Weddell Sea. Journal of the Marine Biological Association of the UK 84 (5): 919-924. Pawlowski, J., M. Holzmann, C. Berney, J. Fahrni, T. Cedhagen & S. S. Bowser. 2002. Phylogeny of allogromiid Foraminifera inferred from SSU rRNA gene sequences. Journal of Foraminiferal Research 32 (4): 334-343.
polythalamous forms, in which the test is divided by septa into a number of chambers. I assume the septa are perforate? As far as I can tell, there's a system of canals connecting adjacent chambers.